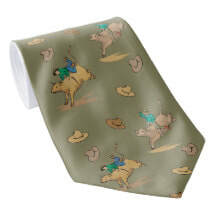 Western print neckties with cowboys, horses, western scenes, rodeo events and bandana prints. Western bow tie and cowboy bolo ties. 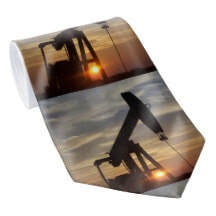 Men may not always be crazy about having to wear a tie to work or for a special occasion, but if that have to, it might as well be something they like. 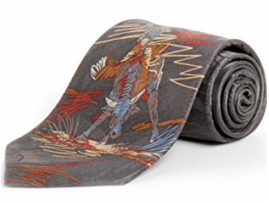 For men who want to add a touch of western or rodeo print to their outfit, I'd like for you to see some neckties with western themes. 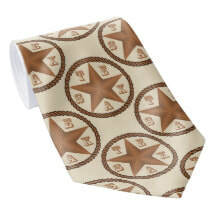 There are als0 bow ties with a western flair and western bolo ties in different varieties.. 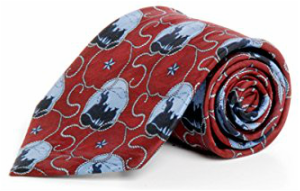 These ties are from Circle S. They have several patterns and colors of western prints. They are 60 inches long. You can see the other ties from Circle S and the patterns shown above in different colors. These bow ties with the metal tips speak western to me. The tips on them remind me of collar tips that are worn a lot with western shirts. 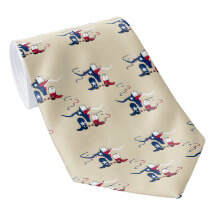 These ties are made of polyester and synthetic leather. The gold accents at the bottom are metal. It is adjustable for men or boys. They come in a few other colors, but for western, I like the black, white or red. 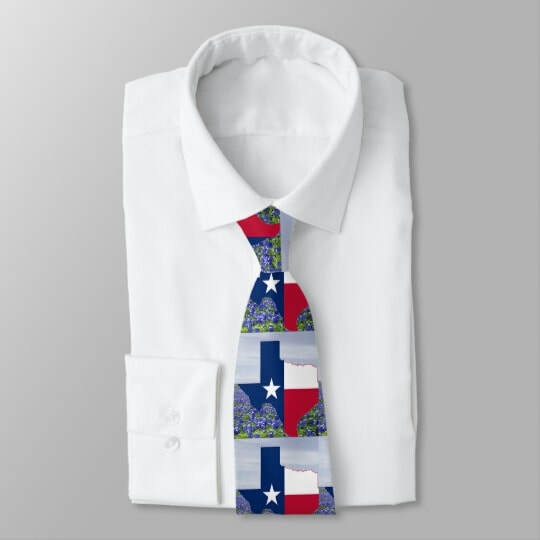 I like the look of these ties with a southwest flair. They are available in these 2 colors. 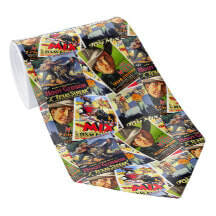 Cross over ties are also a good choice for adding a western flair. 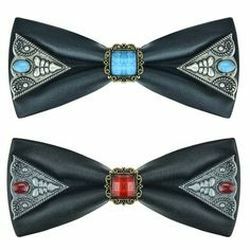 Similar to a bow tie and dressy enough to weat with a tux style shirt, but just not as formal as a bow tie. These are perfect for dressing up western. 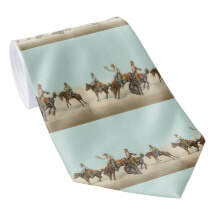 Dress grooms and groomsmen for a western wedding. 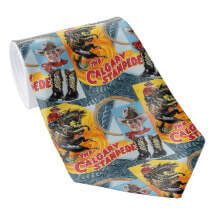 Use them for western parties or to finish off a western costume. 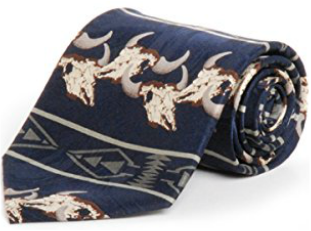 Bolo ties are worn by men and women as a western accessory. Some are so beautiful that they could really be called jewelry. I have only shown a few of the many styles available. There are ones with simple conchos, golden eagles, state symbols and you name it. If you click on any of these, you will also see more styles shown underneath it that you can brows through. These bolo ties are by Landisun. It is 40' inches long. You can choose from different initials and if you happen to be ordering one for a gift they have gift wrap available. Is that lone star for the State Of Texas? This Texan thinks so. This bolo tie is also approximately 40 inches long. There is a matching belt buckle that is available for this piece. 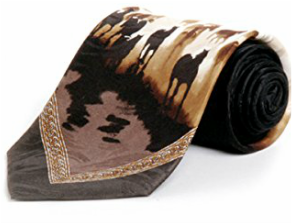 This one is really pretty and would look good with any western shirt, but especially a dark one similar to the way they have the black background in the picture. Here is a nice one with a red coral stone, rope edges and lots of silver detail. The strings are leatherette with tips on the bottom. 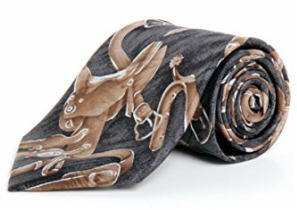 If you really want to step it up, this Kingman Turquoise bolo created by Navajo artist Ernest Begay is a beautiful tie. It is set in sterling silver and hallmarked on the back. I'm not saying that adults couldn't wear these also. 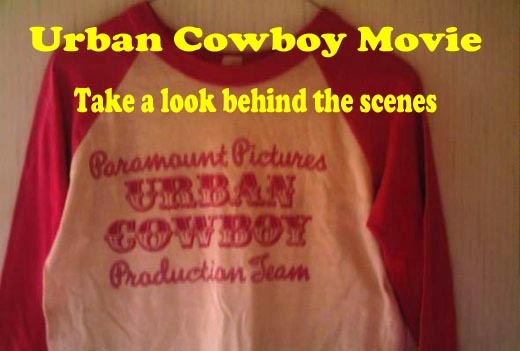 Just pointing out that these are very inexpensive and would be perfect for kids to play dress up it, use for school plays, a quick photo shoot or for a western Halloween costume. Go -Texan Day in Houston around 1960. You can still get that vintage look by using the sepia filter on your computer or camera that has photo editing. There was a different background on this photo, but I played with it in Photoshop and added the blue background and red rope design. 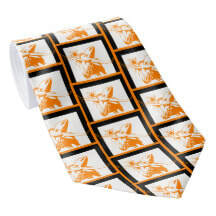 ​I hope you will have a look at some of the western neckties that are available in my Rodeo Days Store​. ​Here are a few examples. 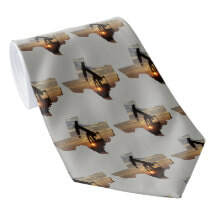 I have updated my tie collection to include some Texas themes, oil and gas themes and of course more western prints. Here are more examples. Stop by and see them all.